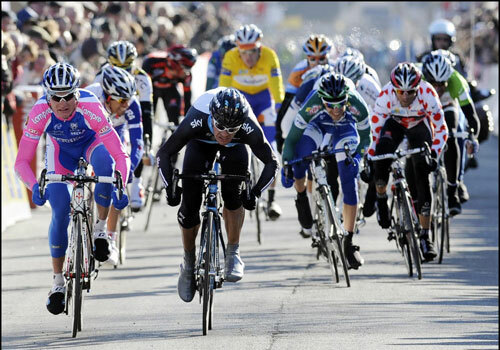 Team Sky’s Greg Henderson pipped Lampre’s Slovenian rider Grega Bole on the line to win stage one of Paris-Nice. But that barely begins to tell the story of a dramatic opening road stage. 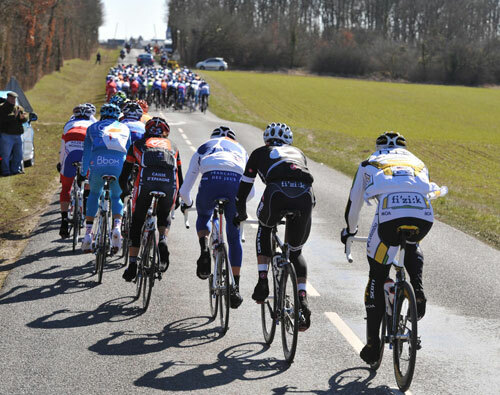 The bunch split in the icy crosswinds in the final 30 kilometres as a group of riders broke clear from the peloton. The sight of a Spanish team, Caisse d’Epargne, splitting the race in crosswinds must have had many observers scratching their heads, but Alejandro Valverde, Jose Ivan Gutierrez, Jose Vicente Garcia Acosta and defending Paris-Nice champion Luis Leon Sanchez drove the pace at the front and they received plenty of help from other interested parties. Jens Voigt (Saxo Bank), who was runner-up in Sunday’s prologue, was also keen to press on, as was Britain’s David Millar (Garmin-Transitions). In the end, the leading group 17 seconds clear of the main bunch. A second gained per kilometre of hard riding may not seem like much reward, but it has set the pattern for the rest of the week. But the most impressive piece of riding was by the yellow jersey holder, Lars Boom (Rabobank). The Dutchman missed the split when it first happened but was alert to the danger and rode across the gap with a fine display of power. That wasn’t the only drama of the race. With around three kilometres to go, Astana’s Alberto Contador, one of the favourites for overall victory in Nice come Sunday, crashed on the grass verge. One of his team-mates handed him a bike quickly and Contador was back in the bunch in no time after he sat in the slipstream of a Rabobank team car. 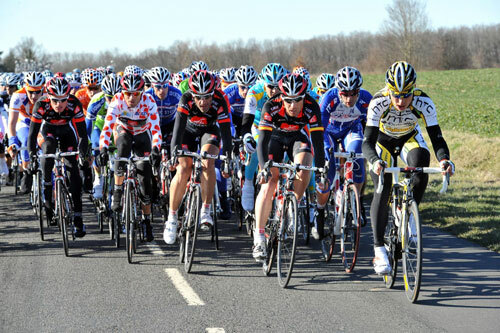 The 201.5-kilometre stage started in Saint-Arnoult-en-Yvelines and headed south to Contres. The first big break of the day featured Albert Timmer of Skil-Shimano and Romain Feillu of Vacansoleil, of two small Dutch teams eager to impress ASO with the selection of Tour de France places still to be announced. They were caught, perhaps too early for the bunch’s liking, because with 38 kilometres to go, Philippe Gilbert of Omega Pharma and Tom Veelers of Skil-Shimano attacked. For a while they looked good, but the bunch began to reel them in and when they did so, the wind played havoc. There were a couple of crashes in the bunch, and then the bunch split at the front. Boom missed it and a quick look around showed him there were none of his Rabobank team-mates on hand to pace him across, so he had to do it alone. Although the bunch chased, the leading group of 17 pressed on. Team Sky’s Kiwi Henderson, sensing he had a chance to win the sprint, was happy to help set the pace. Ireland’s Nicolas Roche (Ag2r) looked to be his biggest threat. Inside the final kilometre, Serguei Ivanov of Katusha attacked, but was quickly caught, then Tony Martin (HTC-Columbia) tried his luck in a huge gear. He was reeled in by Bole of Lampre, who looked good until Henderson’s powerful late surge. Boom defended his leader’s jersey, Voigt stays second and David Millar moves up to third. 10. Roman Kreuziger (Cze) Liquigas all same time.